Since car makers haven't brought all their delights to the U.S., we have to hunt down these machines in their natural habitat. Welcome to Jalopnik's European Review series. 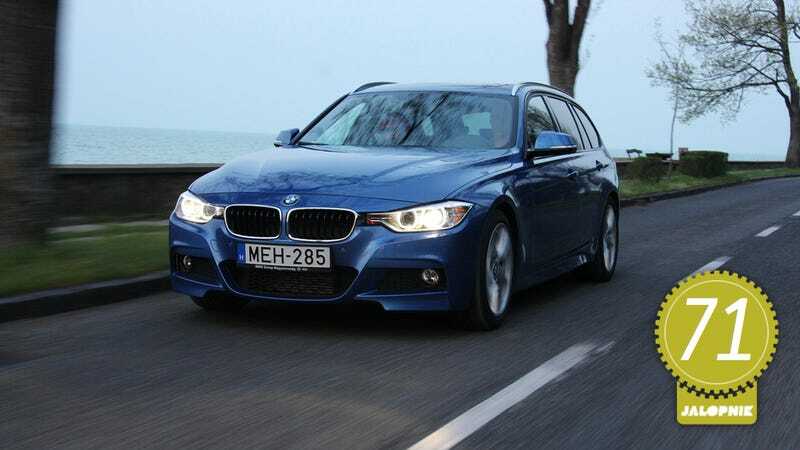 We start with this Estoril Blue BMW 320d M Sport Touring, which will become America's BMW 328d wagon. We've already reviewed the new BMW 3-Series. That car was a 335i sedan (otherwise known as almost an M3). Travis loved it, and it scored a healthy 73 points in our review system. But the 320d is a very different animal. It's a wagon, and at this point, you might think that's not a big deal since you can get a 328i xDrive Sports Wagon in the States as well. It's also a diesel which may or may not remind you of buses. Fair enough. But let me tell you in advance: For what it was designed to do, BMW's F30 320d Touring with the M Sports Pack is probably the best product out there and you should be excited you're getting it as the 328d later this year (plus urea injection to make it 50-state legal). When this 3-Series came out, I thought "oh boy, how much wider and lower can the Bavarians make that BMW kidney grill in order to make it look like it's a 5-Series?" The answer is "a lot more," but I'm over that now, and while the sedan's rear is nothing to be excited about, Jean-Francois Huet did well with the wagon. It's sleek, the lines are very dynamic and that makes it look like a car that doesn't like to be stationary at all. The M Sport Package helps accentuate that by bringing tinted windows, a sporty body kit, M alloys and a suspension lowered by 0.4 inches into the picture. The Estoril Blue paint is an option only available for the M Pack, but it's worth every penny. The 320d is also a BMW that won't make you look like an asshat from day one. It's a wagon, which makes it a fast family car instead of middle manager boy's toy in the public eye. Even the girl taking my card at the petrol station started telling me how nice it is while dealing with the transaction. Since I'm pretty sure it can get you laid, it well deserves the seven points. If you've sat in a modern BMW, you know what to expect the moment you jump in. Nevertheless the 3-Series is a nice place to spend time and the build quality is very good. This car had 14,000 (abusive press) miles on the clock when I got the keys remote control, but everything felt brand new. Naturally, the Sport Pack is responsible for the best parts. The M steering wheel's friendly grip is only overshadowed by the Alcantara seats, which not only give you great support in the corners, but are also comfortable and good-looking with a diamond-pattern stitching in contrasting blue. The exterior color appears as a line on the dash and the key, which is a nice touch. I also had the optional panoramic sunroof open every time we went slow enough to deal with the wind noise. On the other hand, the cabin gets bad points for the "Aluminium Hexagon" trim which is made of plastic instead of something only slightly more expensive (and heavy) like stainless steel or aluminum. I guess it isn't too much to ask for less fake materials in a premium car. BMW's warning noises are also very irritating, not to mention the artificial indicator relay sound. Yeah, I know, I should get back to my much loved classic cars and stop whining. But the best part is just coming up! Forget zero to sixty. It's somewhere under 8 seconds, even with the eight-speed automatic and everything set to super sporty, thanks massive turbo lag when you floor it. So don't expect burnouts with this one. But dynamic acceleration is fantastic, and that's what really matters. This 2.0-liter turbodiesel puts down 184 horsepower and 280 foot pound available from 1750 rpm, meaning that even set to Eco Pro mode for maximum fuel efficiency (which keeps revs low and uses regenerative braking to charge the battery instead of the engine), the 320d jumps like crazy when you want to overtake someone. It's quite addictive. Maybe it's some sort of drug my skin has sucked up from the steering wheel, but I found myself speeding most of the time. It makes you go fast in a very discreet manner. I tried the 3-Series last year on an airfield, and I know the brakes can take a lot. That's probably why I didn't abuse this one. But even without the optional M brake pack, I have no doubt the 320d can stop its 3,461 pounds wherever needed. Pedal feel is just about right, and while the start-stop system cuts the engine every time you stop at a red light, at least it now knows the difference between stopping and moving very slowly. Also, you can switch it off completely, but with European fuel prices constantly in mind, I didn't. The question of brake fade shouldn't even come up in connection with a diesel wagon, so let's move on. There is some great news though: The 320d comes with a proper handbrake instead of a ridiculous electric one. I have no idea how they have done it. Maybe a few gallons of virgin blood or a fleet of sacrificed animals was needed during development, but this car rides like a dream on its Bridgestone 225/40 (front) and 255/35 (rear) tires. You know exactly what's going on on the road, but even if you switch the suspension settings to Sport, it remains friendly to your back, quiet and comfortable. It's a great cruiser even for those who sit in the back without ever being soft. The chassis is rigid and well balanced, so you can throw it around B-roads like there's no tomorrow. There's enough grip, and while the rear won't be too keen to start dancing even if you switch off the nannies, this wasn't designed to be a race car, so that's all just fine. You stay safe. When you switch it to Sport, things sharpen up. The engine revs more. The steering becomes heavier. The slight understeer can probably be turned into a bit of oversteer on the way out of a corner. But, to be honest, I didn't push it that hard. It's still a wagon. "Oh no, it's a diesel wagon with an automatic!" is what I should have said after the first miles. But I didn't. The eight-speed Steptronic is no manual, but it's more efficient than my right hand could ever be. It works well and shifts fast enough in most cases. However, eight speeds are quite a handful, and in some situations it isn't quite sure which one to choose. Not a big deal, but together with the turbo lag, it can slow you down for a second or two. The other thing is the flappy paddle idea. Why would you ever want to use that unless you're having a mid-life crisis and want to play Formula-1 on the way to the grocery store? Since it actually makes the car slower, I touched it just once, only to go back to D again and enjoy what German engineering can offer on a sunny afternoon. Useless function indeed. Well, that's not quite up to the rest of the car. In fact, the 320d is an average musician at best. First of all, you have the sound of the engine which is a diesel. Enough said. Luckily, the cabin is quiet thanks to the decent sound-proofing, so you turn to the radio. But while the standard system can be just as loud as the neighboring teenager's VW Golf, it doesn't sound premium at any volume. Maybe the devil is in the settings, but the sound of the turbo was more exciting than what the speakers could offer. Still, you can hook up all your gadgets to the infotainment system, and there's a Bluetooth connection for advanced users. Also, for more money, you can get a better stereo from harman/kardon. Ok, so my favorite were the door handle lights. I mean what are the chances of not finding the door of your car, right? About zero. Still, the Bimmer has lights. Excellent. Moving on to what matters, this well equipped example came with parking assist, automatic high beams, satellite navigation, keyless entry, start-stop, power sunroof and rear door, and hell knows what else I haven't even realized in six days. Still, I was missing head up display, but looking at the Efficient Dynamics data, I was really proud of myself when I managed to drive...you know...efficientdynamically. That's a tough one. The one I drove is a car you can't exactly buy and we don't have a U.S. price yet. In the UK, it's around $60,000 with all the extras. The base price for the manual is ten grand less. In the US, if you want a 3-Series Wagon, right now you have to go for the 328i xDrive. That starts at $41,450 with more power and all-wheel drive. BMW hasn't released pricing yet for the U.S., but expect a price at least in the mid-$40s to start and upwards of $50,000 spec'd as this. Maybe BMW will surprise us with a lower price? I haven't tried the all-wheel drive petrol version, but what I can tell you about the 320d with the M Pack is that it's a very good product. Yes, it's a bit boring with the eight-speed automatic and the effortless cruising, but that's a good thing if someone spends that kind of money on a family car. And it's something even the driver can enjoy when off duty. Also, without ever going on the highway, but using it in traffic jams and on fast B-roads instead, I averaged 38 (US) mpg, which is far from factory claimed numbers, but close to real life happiness in a sporty two-liter. We can be fairly hard on BMW and Mini a lot of the time. Maybe it's because we know how great their cars can be and have amazingly high expectations for every single model? As long as they also have these sort of cars in their lineup, I don't think they should worry too much. This is exactly what BMW should be making. Let's hope America will enjoy it when it's their turn.